As you can see, I actually have two sample sizes of this open and I really don't know why. Oops. This mascara has quite a nicely shaped fibre brush with a nice point to the end to work on the inner lashes. This mascara creates quite defined lashes but I don't feel as though it holds a curl. Would I repurchase it? Nope. It's not a favourite of mine and I just don't think it's worth the $52.00 price tag. I have a full review of this mascara here but I think it's really nice. It's not the type of wand that I typically go for these days but it creates a very natural and defined look that's perfect for everyday wear. My lashes are quite long naturally but with this mascara it looks like they go for days! Would I repurchase it? Definitely! This mascara is ridiculously hyped about in the beauty community so, of course, I bought it to see what all the fuss was about. Surprisingly, I really didn't like it. I was really disappointed by it but I really don't like the way it makes my lashes look; clumpy and spidery. No thank you. Would I repurchase it? Nope. Never! I was sent this mascara a while back and opened it recently but, unfortunately, I was quite disappointed but this mascara also. It did give them effect of volume, yes, but also made me look like I had about three eyelashes in total on each eye and let's be honest, no on likes that look. The wand is extremely thick but the actual bristles are so short, making it quite difficult to use. Would I repurchase it? No, thank you! Eee, I really love this mascara. I have a full review here, but I really love the effect that it creates. It makes my lashes look full and fluttery, whilst defining each individual lash. I cannot say enough about this beauty. Would I repurchase it? Yes! It's not an everyday mascara as it's $48.00, but I'd definitely buy it once or twice a year as a treat. This is another mascara that I'm quite fond of. It probably gives the most natural look of all three, making it perfect for no make up make up looks. It defines the lashes and adds volume without creating too much drama. For a full review of this mascara, click here. Would I repurchase it? Yes. As you can see, I have a number of different mascaras open from a number of price points. I like to try both 'drugstore' and high end mascaras and I feel like I've found a few gems lately. 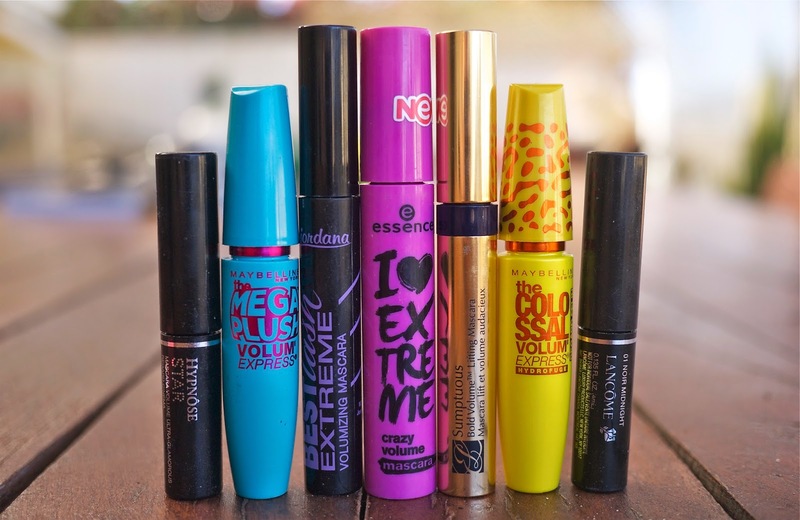 How many mascaras do you have open at any given time? Are you as bad as me? Have you tried any of these mascara before? Would you like to see better reviews of any of them? I think I have four mascaras opened at the moment. I'm trying to use some up there's one that I don't grab because it's not water resistant.. hmm I should just chuck it out. I like this kind of post. It's quick guide to what's working for you and what they each do. Looking forward to reading more of these in the future! i try REALLY REALLY hard not to have too many mascaras open but right now i have....four? honestly three of them are...'meh' but i can't really just throw them away because i feel guilty about wasting product. ugghh..i probably should just ditch them since they've been sitting around unused for so long..